Though it may not seem possible, or even necessary, Patek Philippe, arguably the most traditional and respected of Swiss manufactures, has fully outdone itself in terms of both the anniversary timepieces and the way they were introduced to guests. But I do suppose that to stay on top of your game, you must continue to better yourself again and again. And this Patek Philippe has certainly done with the presentation of watches created in honor of the esteemed brand’s 175th anniversary. The evening began with a very “wild” walk through a factory that had changed so much for the celebrations that it was practically not to be recognized in comparison to its day-to-day look: the main entrance had been covered by a temporary roof, the (usually concrete) ground became a disco flash of flooring, and a light show was initiated that finds no equal in the watch world. I don’t have to say that it fully mesmerized the close to 300 guests with its artistic expression, innovative visuals (some of which included a laser tracing the shape of the spring-shaped sculpture in front of the factory), and storytelling ability leading from Geneva to Paris to New York City and back through the hills of Switzerland’s Jura. The effect was much like that of being in a very high-quality IMAX theater, though instead of seeing a Transformer ravage Detroit, we experienced the moving history of what is arguably the world’s best Swiss watchmaker in visuals that were worth far more than 1,000 words: they traveled right through the veins to arrive straight in the middle of the heart. As I stood in awe of the spectacle in front of and around me, I felt like history was literally washing down over me. 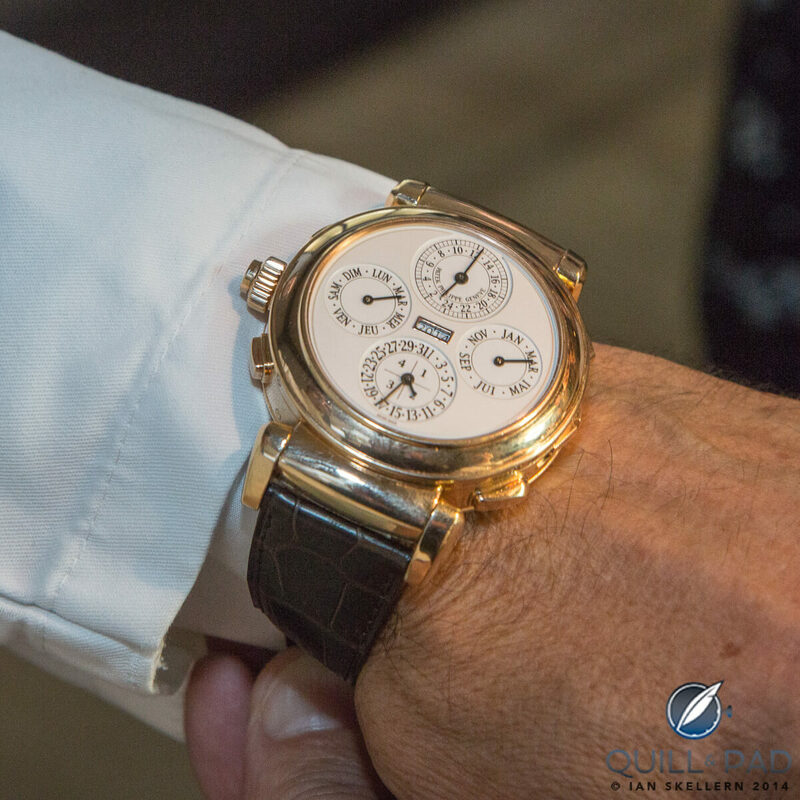 Providing somewhat of a rest from the thunder of these emotions, just-retired Patek Philippe president Philippe Stern, the previous third-generation leader of the brand, took the stage and engagingly spoke about the legacy of his company and the 150-year celebrations of 1989, which culminated in the spectacular Calibre 89 timepiece. At that time, Stern stated, Patek Philippe had less than 300 employees. Today, 1600 people work for Patek Philippe in Geneva, and 2200 worldwide. Stern then introduced his son Thierry, now president of Patek Philippe and the fourth-generation of Sterns to lead the company. 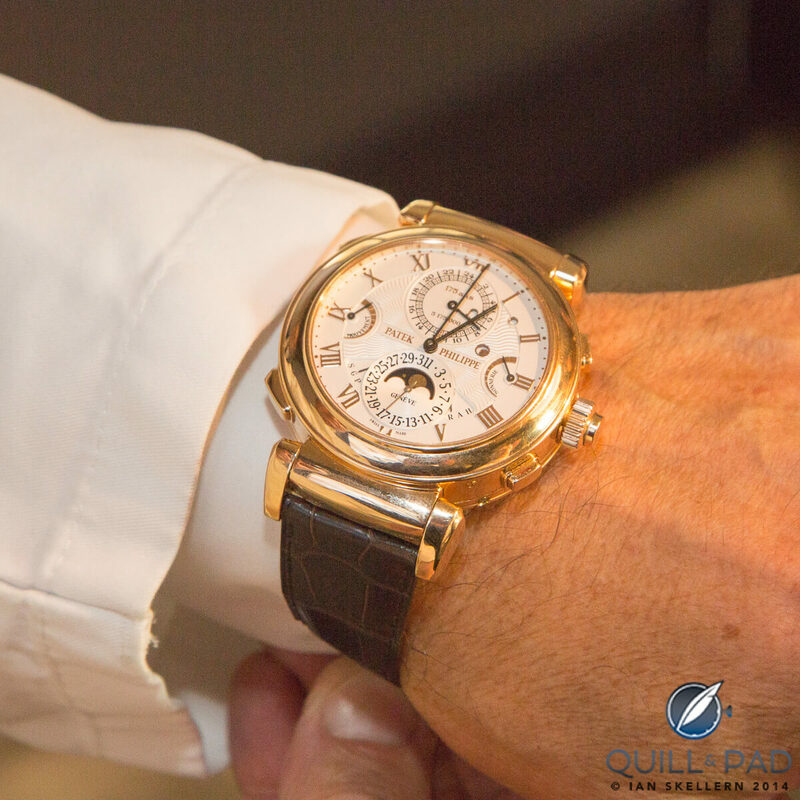 Both men ensured the audience mainly comprising journalists and tastemakers that the duo had agreed that Patek Philippe would remain firmly in the hands of the family for at least the next 25 years. Then came the evening’s main event: the watch introductions, which began with the Grandmaster Chime, a timepiece seven years in the making and will only be manufactured in an edition of seven pieces. Each of these are priced at 2.5 million Swiss francs, though the first one will be held back for permanent display at the Patek Philippe Museum in Geneva, which leaves six to be sold. The Grandmaster Chime is grandiose in every way, a fitting tribute to the 175-year history of this Geneva staple, and the first anniversary piece made to be worn on the wrist. The double-faced timepiece, whose solid 18-karat red gold case swivels like that of the late Dominique Loiseau’s oeuvre 1f4, is completely covered in beautiful hand-engraving depicting laurel leaves, down to the folding clasp. The decoration fittingly symbolizes the importance of this timepiece in the continuing history of Patek Philippe. Its manually wound Caliber 300, containing 1,366 individual components, registered six new patented innovations. Five of its functions chime, including the grande sonnerie, which automatically chimes the hour and quarter on three gongs. Novel here is that each of the quarter-hour chimes has its own melody. A lever on the side of the case allows the wearer to change this into a petite sonnerie (strikes only the hour) or put it on silence mode (no strike). It also includes a minute repeater (hours, quarters, and minutes) and an alarm that strikes the time and is programmable at quarter-hour intervals. The latter function was the subject of one of the patents. Another of the patented functions constitutes a date window part of the perpetual calendar that also chimes on demand: a double high-low note (“ding dong”) sounds for each multiple of ten (10, 20 or 30), while a single high-pitched note (“ding”) sounds the single digit numeral. The side of the watch displaying the standard time also contains the chiming functions, alarm, power reserve indications for both movement and strike train, crown position indicator, moon phase and date (of perpetual calendar). The second side shows the 24-hour display and perpetual calendar including a four-year indication with leap-year cycle. A patented mechanism allows correction in both directions. Notable here is the absence of a tourbillon, though I do not in any way miss it. In fact, I find it refreshing that the Grandmaster Chime focuses so completely on the chiming functions and art of engraving. 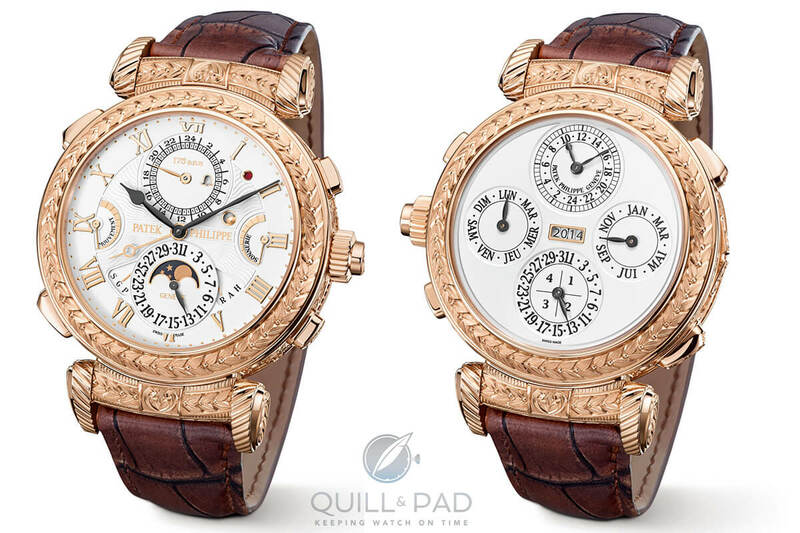 Patek Philippe has introduced several special watches in honor of the anniversary, which is fairly unprecedented. * The highly decorative, engraved Reference 5275 Chiming Jump Hour with a – what else? – jump hour indication that chimes a single strike. * Reference 5575 World Time Moon in a 39.8 mm white gold case with black dial for men and Reference 7175 World Time Moon in a 38 mm red gold case with a diamond-set bezel for women. Both exhibit highly poetic dials complete with realistic moon phases and even a starry sky. * The Reference 5975 Multi-Scale Chronograph in 40 mm cases including white gold, yellow gold or platinum boasts a nostalgic telemeter-outfitted dial, while the Reference 4675 Multi-Scale Chronograph comes in a 37 mm white or rose gold case for women. Here the decorative dial boasts 12 baguette-cut diamond markers and fashionable blue or purple straps. The anniversary celebration included an exhibition of the company’s “rare handcrafts” accompanied by many unique and one-off pieces on display along with their creators’ demonstrations. We will come back to these in a future post. To read about one of them, Dawn on the Lake, a unique pocket watch featuring rare handcrafts created by Anita Porchet in honor of the anniversary please read Dawn On The Lake: Celebrating Patek Philippe’s Grandiose 175th Anniversary With Art And Collaboration. For now, please enjoy our original photography of the real stars of the evening: the timepieces. 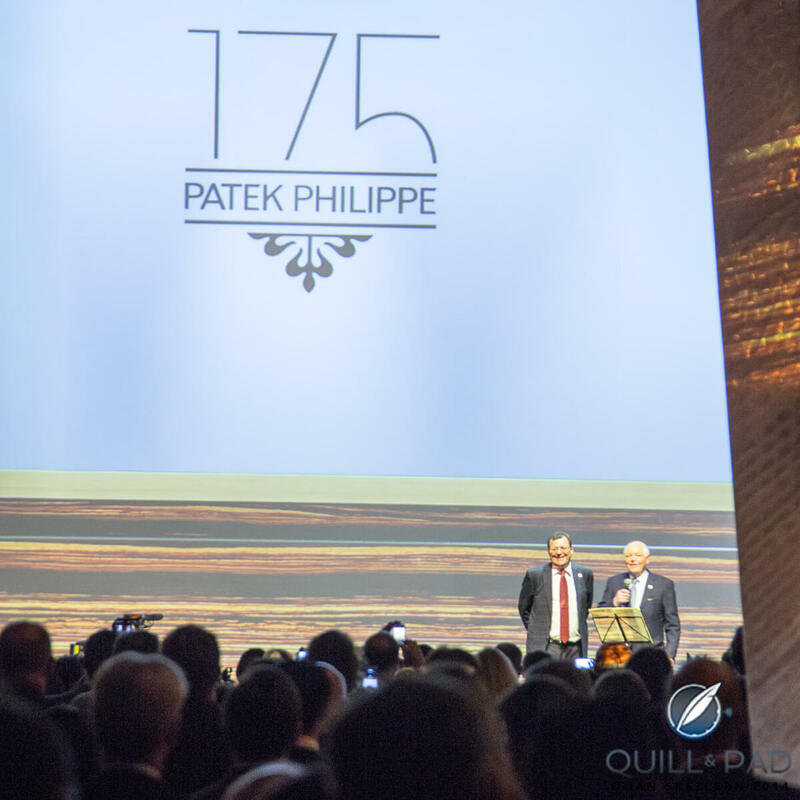 For more information on Patek Philippe’s 175th anniversary please read The Secret For Eternal Youth: Patek Philippe Is 175 Years Young. To read up on one of Baselworld 2014’s main introductions, please see Joshua Munchow’s story 175 Years of Heritage And Legacy: The Patek Philippe 5304R Grand Complication.